Children at risk from uncovered coal wagons. 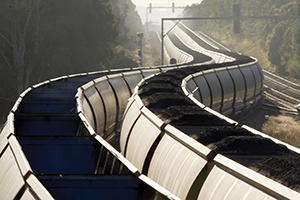 Coal dust from uncovered train wagons is inhaled by more than 23,000 students at 60 schools located within 500 metres of the railway from Hunter Valley mines to the port of Newcastle. “It means students spend their lunchtimes playing while breathing air filled with coal dust emanating from passing trains,” commented local newspaper the Newcastle Herald, which has been campaigning to have covers put on coal wagons. “Many also spend their days in classrooms without air-conditioners or air filters to protect them from damaging particulates that are contained in the dust,” the paper said. Singleton GP Dr Tuan Au has been investigating a link between open-cut coal mining operations and rising respiratory illness in his community. His 2009 study of 683 primary and secondary students in the Singleton area found one in six had diminished lung function. In nearby Branxton, where children were further from the mines, only one in 20 had lower lung function. Dr Au said particulates in coal dust had been shown to damage lungs – especially in children. “Energy policy must take into account the public health impacts of coal while meeting our energy needs,” he told a public meeting. Dr Au told the Newcastle Herald that before any new coal mine opens up, baseline health studies of local people should be done to determine their level of asthma, cardiovascular disease, cancer, premature births and psychiatric problems and that the findings form the basis of long-term studies. He also argued that everyone in an area impacted by a coal mine should be entitled to a free annual health check. “The government should investigate sending local school children to a camp away from coal mining areas for a few weeks each year, to get some fresh air,” he said.